They gathered around a bonfire one summer evening to enjoy good company and the soothing crackle created by the flames. 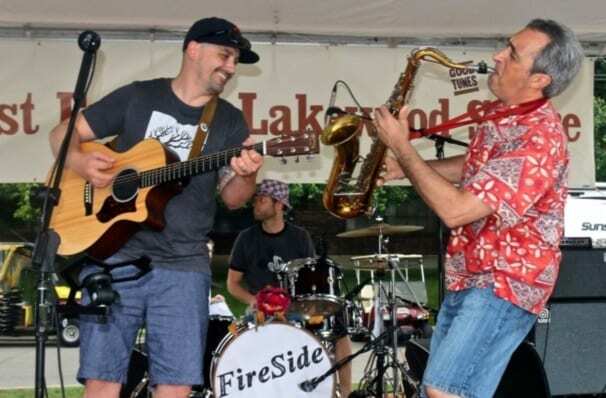 Little did they know the experience would ultimately result in FireSide – the outstanding acoustic rock band performing at LakewoodAlive’s Front Porch Concert Series this Friday, August 10. Week 8 of the series is presented by The Exchange and features FireSide, a local quintet that has amassed a large following by playing classic and current rock tunes in its own acoustic interpretations. This Lakewood-based band consists of John Levis (Vocals/Guitar), Tom Leatherman (Vocals/Keyboards/Percussion), Lance Healy (Percussion/Harmonica), Frank Restifo (Electric Guitar/Sax/ Vocals) and Jim Latham (Bass). 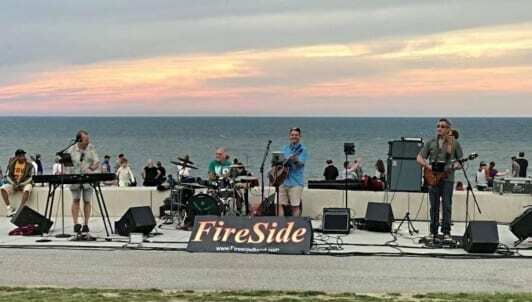 FireSide – both the name and the band – originated when a group of dads played instruments around a campfire while camping with their children and the YMCA Adventure Guides. The group enjoyed playing together and FireSide was born. The band offers fun, unique musical renditions while covering a wide variety of classic rock artists, including Crosby, Stills & Nash, Simon & Garfunkel and The Beatles.